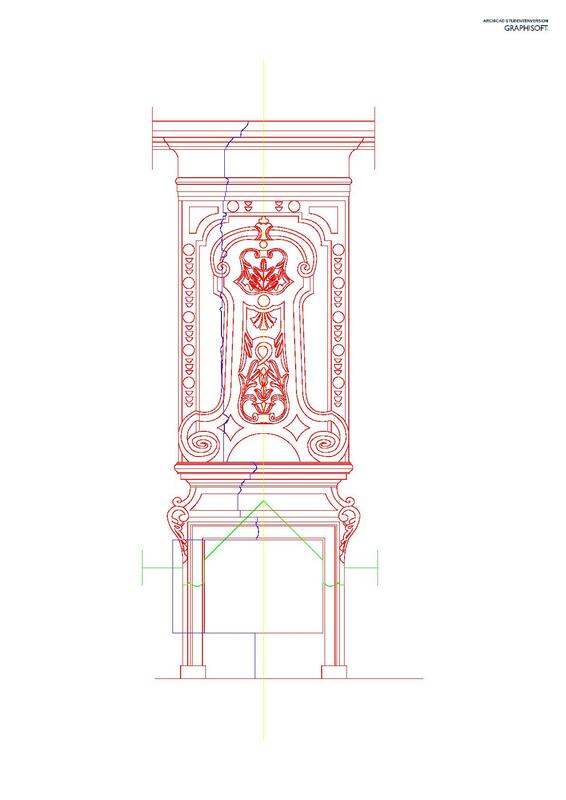 On wednesday 05.08.2015 Matthias Abele and Samuel Beckers started the 3D Reconstrucion of the fireplace in the typing room as part of their semesterwork for the Course "Digital 3D Reconstruction of Schlodien manor - 3D Modelling and documentation against forgetting" at Technische Universität Darmstadt. The fireplace is in the south sided corner of the typing room which is found in the upper floor of Manor Schlodien. 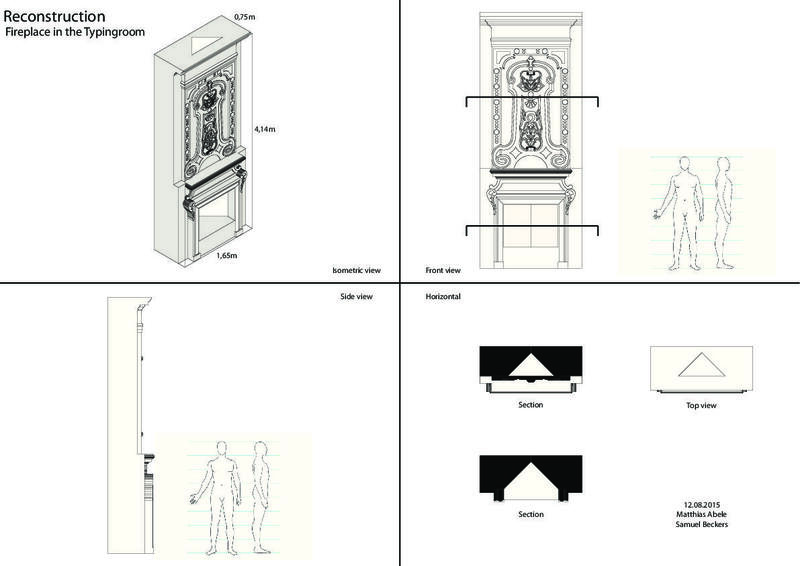 As a starting point they decided to digitalize the Construction drawing, made by Zenon Marzyński by using it as a underlay for the 2d-plans made in archiCAD respectively AutoCAD. The discrepencies between numeric values and drawn lines in the construction drawing made it necessary to interpretate a little and follow rules of thumb regarding perpendicularity and symmetrie of the whole construction. 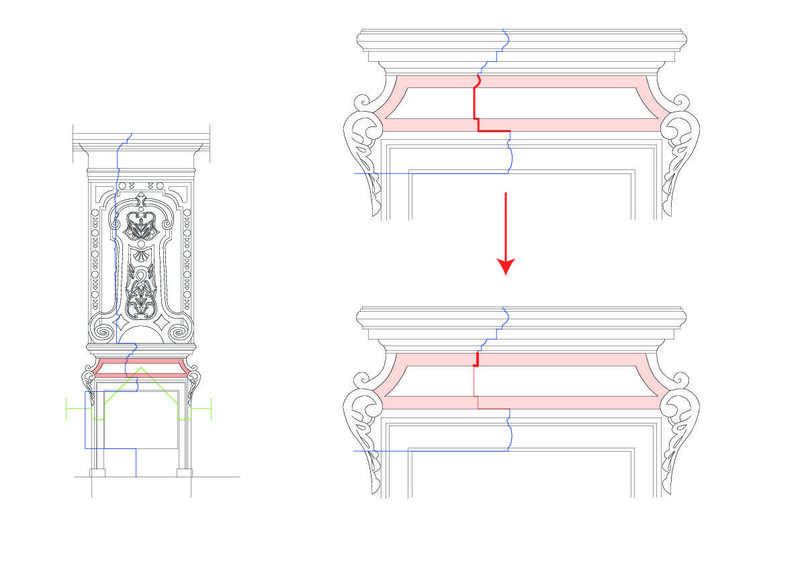 In the following we used those rules of symmetrie by only redrawing the left side of the fireplace and mirror it as the right side, to get the whole fireplace. 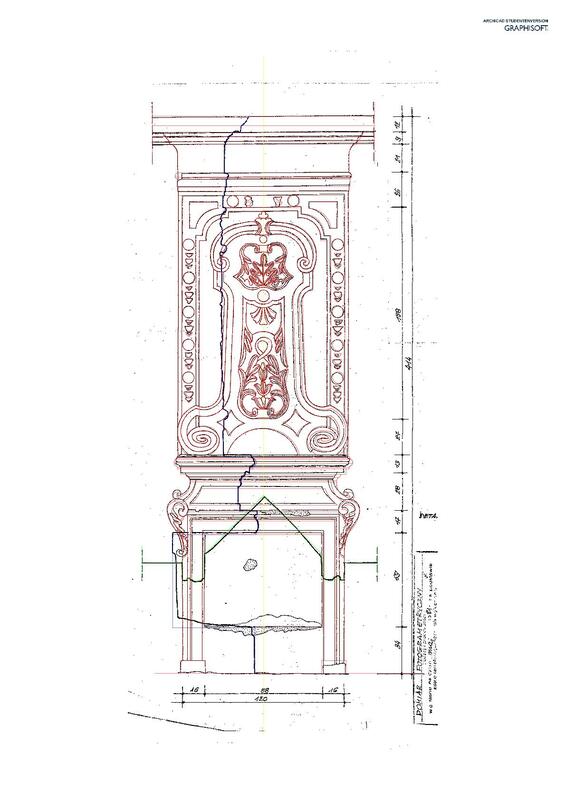 The fact, that the fireplace had been quite well preserved helped enormousely, since the Photographic material contains a lot of essential information, that helped make sense of the numerous ornaments decorating the fireplace, for example while analyzing the marked areas in the attached fig.3. 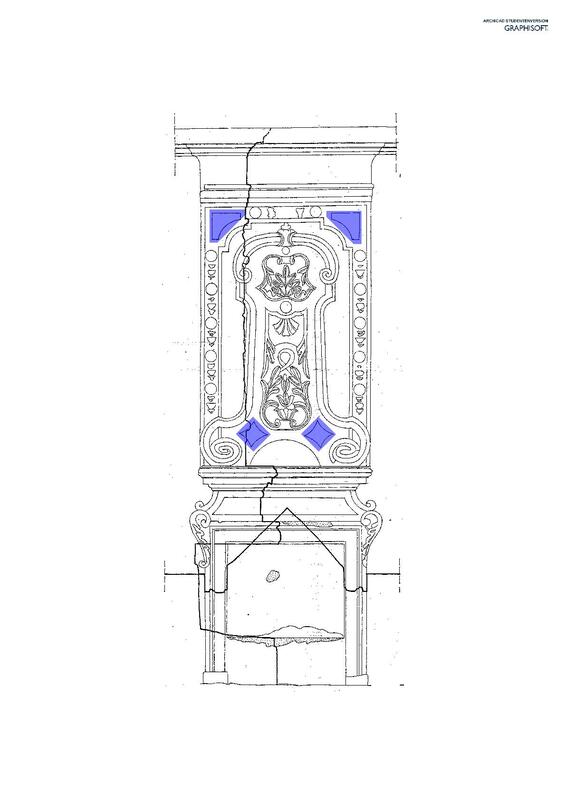 Since there is no information given about neither the depth, nor the exact scale of the discussed decoration, the shadows had to be seen as guides for deciding the appearance of those parts. In the following sessions the 3d-reconstruction has been made in team-work, so that problematic decisions resulting from either not enough or not conclusive material could be discussed and taken together. This was the case in the following example. 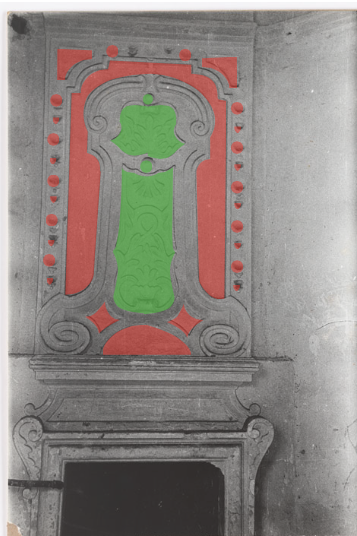 We can see, that while the section says that the upper part of the ornament differs from the lower part, the view suggests that this isn't the case and that the profiles should be similar. So two decisions had to be made. first: are the profiles similar? In the end a lot of those decisions and the construction of the 3dmodel in teamwork lead to completion of the task on August 12. Last updated on Tue, 02/16/2016 - 18:07. Originally submitted by Matthias Abele on 07/16/2015 - 14:10.